Senior right handed pitcher Chris Kovach pitches during the Kingsmen’s matchup against the Chapman University Panthers Saturday, March 16. The Kingsmen fell to the Panthers in the first game of the day, 4-1, but came back strong in the second, beating the Panthers 7-4. Last weekend, the California Lutheran University men’s baseball team went 2-1 in a three-game series against the Chapman University Panthers. The Kingsmen won their first game 12-3 on Friday, March 15. On Saturday, they lost one and won one, finishing at 4-1 and 7-4 respectively. In Friday’s game, the Kingsmen visited the Panthers and put on an absolute hitting clinic. They topped it off with an incredible pitching performance to earn an important conference win. Senior left handed pitcher Justin Fong pitched his first career complete game and added a win to his stat column. Fong pitched nine innings, with only six hits, one earned-run and three strikeouts. The Kingsmen tore apart the Panthers’ bullpen, ending the day with 16 hits and 12 runs batted in. Their hitting performance brought five different Chapman pitchers into Friday’s game. Senior first baseman Weston Clark, who had both a triple and double, was responsible for three of the earned runs. In the top of the seventh, junior infielder Nick Pico hit a two-run homer and put the Kingsmen up 7-3 heading into the eighth. The Kingsmen earned 5 more runs in the eighth and ninth innings to complete the 12-3 win. In Saturday’s first game, the Panthers then headed to Cal Lutheran ready to redeem themselves from Friday’s performance. The Kingsmen started off strong as sophomore infielder Tanner Wright doubled and stole third on a wild pitch. With Wright in scoring position, junior outfielder Ryan Probst was able to hit a deep enough fly ball into left field for the sacrifice fly as Wright came in to score and give the Kingsmen the 1-0 lead. Chapman’s starting pitcher, senior right-hander Jonathan Hernandez, answered right back for the next eight innings, shutting out the Kingsmen for the rest of the game and recording 10 strikeouts. The Kingsmen had several opportunities to try and tie up the game, only down by a run in the bottom of the sixth inning with junior designated hitter Ryne Yamashiro reaching first base with two outs. But Hernandez forced senior catcher Kaden White to ground out into a double play ending the inning. 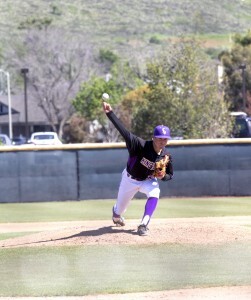 On the mound, the Kingsmen were unable to keep the Panthers down to two runs. In the top of the eighth inning, sophomore right handed pitcher Clay Rickerman loaded the bases and forced a grounder to shortstop, but a Panther was still able to reach home on the play. The next batter for the Panthers hit a fly ball to left field, giving the runner on third enough time to reach home and stretch the score 4-1. Head Coach Marty Slimak then brought in first-year right handed pitcher Alexander Rivas from the bullpen for the two innings of the game. He finished the day with no hits, no runs and two strikeouts. Although the Kingsmen were able to get a runner on in the bottom of the ninth inning, nothing came of it and the Panthers took game two of the series 4-1. With the series tied 1-1 for the weekend, the Panthers and Kingsmen headed back out onto the field that afternoon for the final nine innings of the series. Junior right handed pitcher Scott Roberts took the mound to start off the game for the Kingsmen. Roberts pitched for six innings, only giving up 5 hits and 3 runs and striking out four batters. The Kingsmen were able to collect 12 hits and score runs in the bottom of the second, fifth and seventh innings. The Kingsmen were able to take the game 7-4 and take back the series against the Panthers. The Kingsmen are now tied in second for Southern California Intercollegiate Athletic Conference with a conference record of 4-2. They will host University of Puget Sound on Monday, March 18 at 3 p.m. on George “Sparky” Anderson Field at Cal Lutheran.